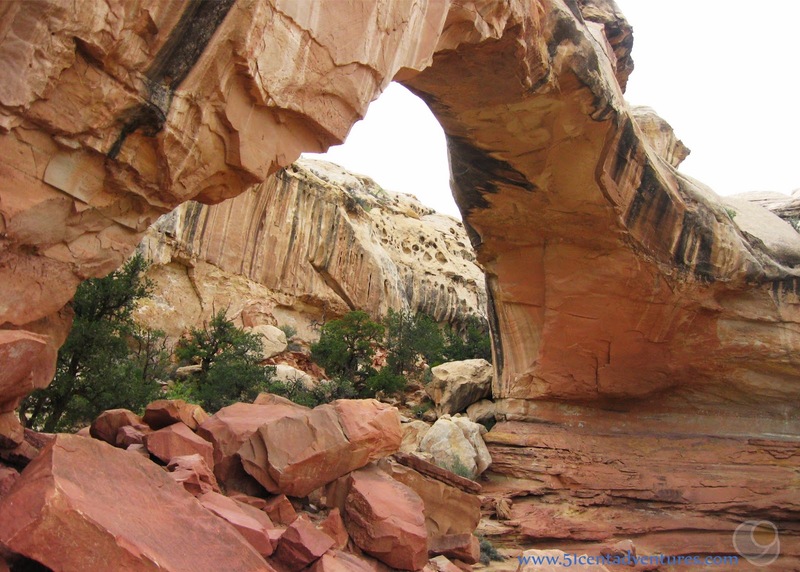 Description: Highway 24 cuts though the heart of Capitol Reef National Park giving you easy access to petroglyphs, pictographs, natural bridges, pioneer era buildings, and spectacular overlooks. Location: Near Torrey, Utah. Which is about an hour an a half away from I-70. Cost: $5.00 per vehicle. The pass is good for 7 days. Camping is $10 per night. Back country permits are free. Operating Seasons and Hours: Open year round. Visitor center hours are 8:00 to 4:00 7 days a week. 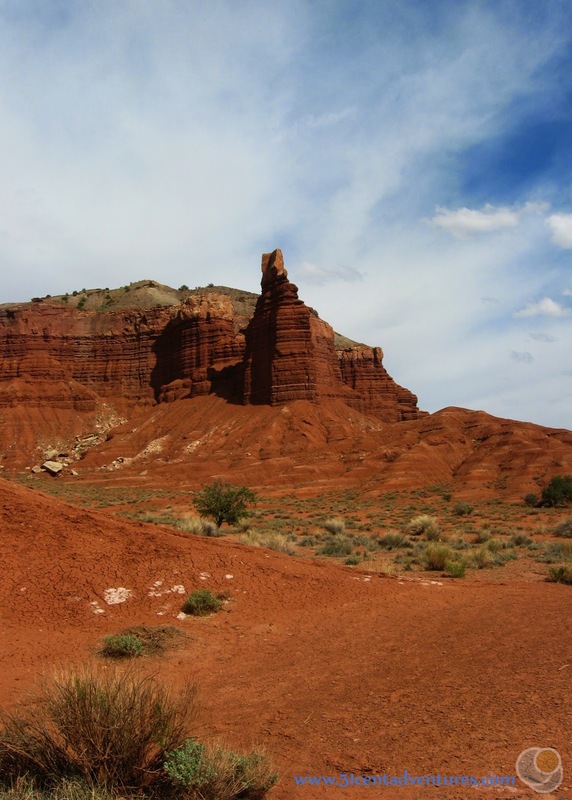 This was the third stop on the fourth day of the Southern Utah Road Trip that my husband and I went on for our anniversary in 2010. 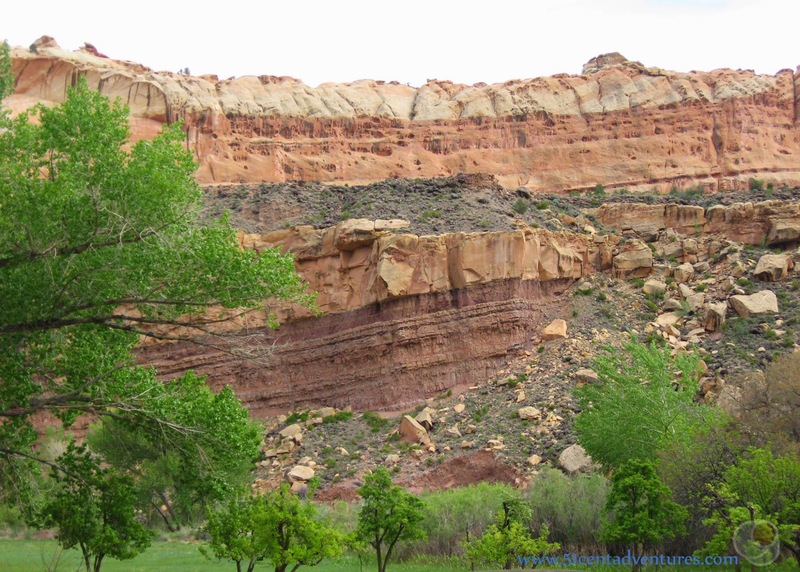 We left Anasazi State Park Museum in Boulder, Utah and drove about an hour to reach Capitol Reef National Park. 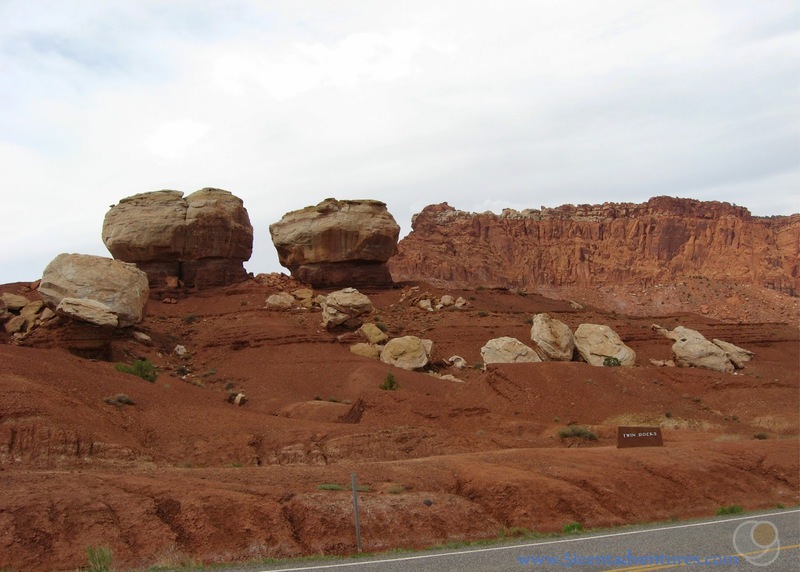 As with the other national parks that we visited on this trip, we didn't have the time to really dig deep and explore all that Capitol Reef had to offer. We would have loved to explore the back county in the Cathedral Valley area of the park, but there just wasn't time in our schedule to do that. All we had time for was about two or three hours of sightseeing as we traveled to our day's destination. 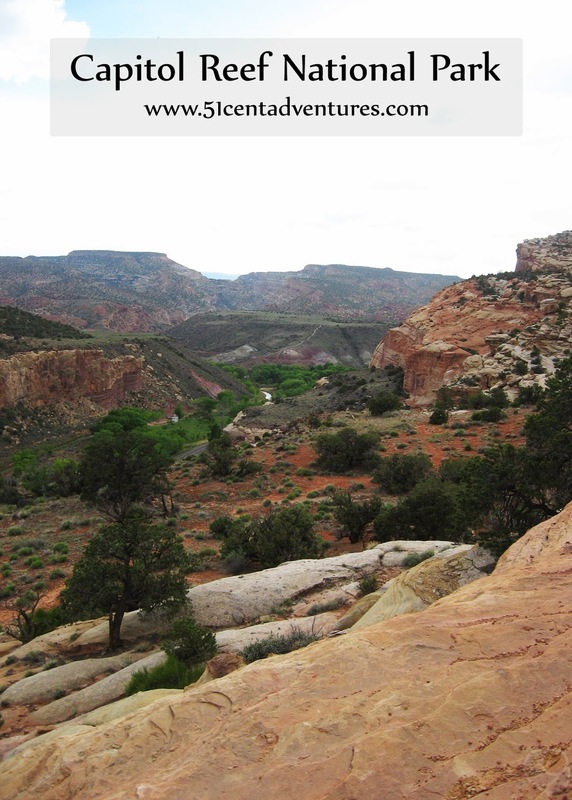 We ended up just driving along Utah Highway 24, and stopping at each area of interest that appeared on the park map. This post will highlight the things that we saw. Before we get into my description of the park I need to tell you something. I believe that the National Parks can be classified using a three tier system. The best national parks are First Tier parks. These are parks such as Yellowstone, Yosemite, and Zion. 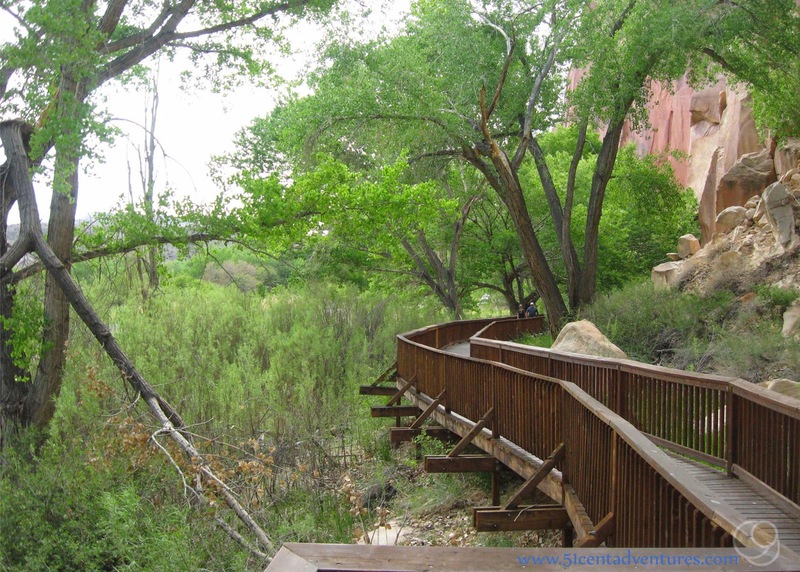 The Second Tier parks include Bryce Canyon and Arches. 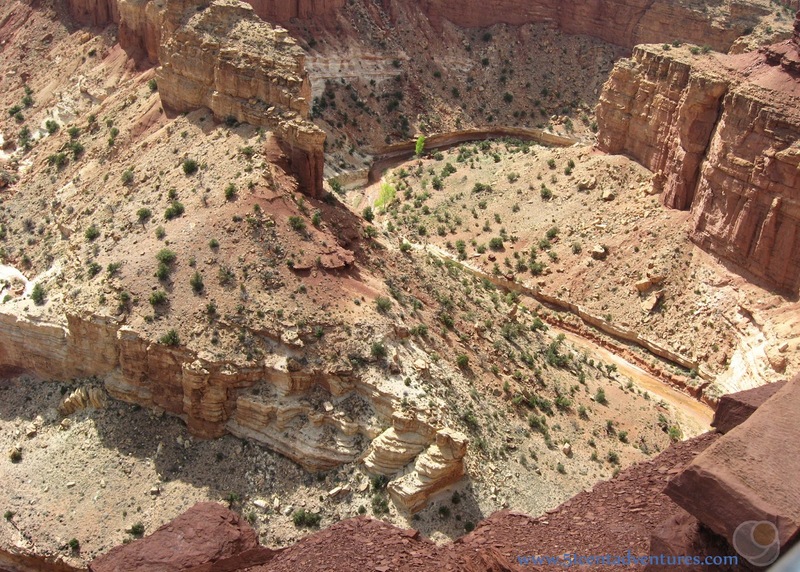 The Third Tier Parks are where I would classify Capitol Reef National Park. It's a good park, but it seems to be lacking the pizzazz of the First and Second Tier parks. Everything is on a much smaller scale. We entered the park from the west side. Unlike Zion or Bryce, there wasn't an entrance station where we needed to show our National Park pass. One minute we were out of the park, and the next minute we were in it. I didn't even realize that we were in the park until we passed the first landmark listed on the park map. These rocks are known as the Twin Rocks. I found them very underwhelming. The only reason I took a picture of them was that I was pregnant with twins. This was another underwhelming feature. My husband and I commented that it seemed that the founders of the park were just trying to make it seem like they had landmarks. This is where the park started getting a little more interesting. 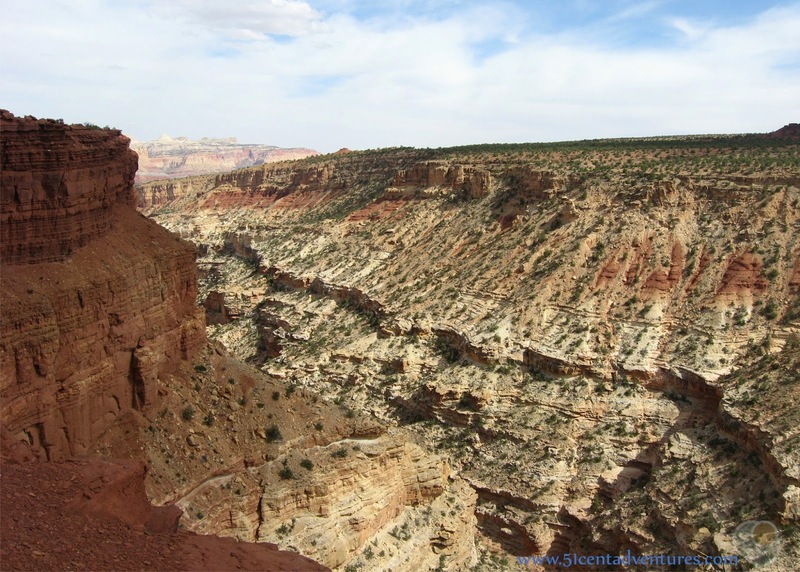 We parked our Jeep at a parking lot at Panorama point and walked a short distance to the Goosenecks overlook. We could see the winding path that Sulphur Creek had carved into the rock over millions of years. Our next stop was the Visitor Center. The parking lot for the building had a great view of The Castle feature. The Visitor Center itself was very small. If we didn't have a National Park Pass this is where we would have paid our $5.00 entrance fee. The Fruita Historic District is near the Visitor Center. 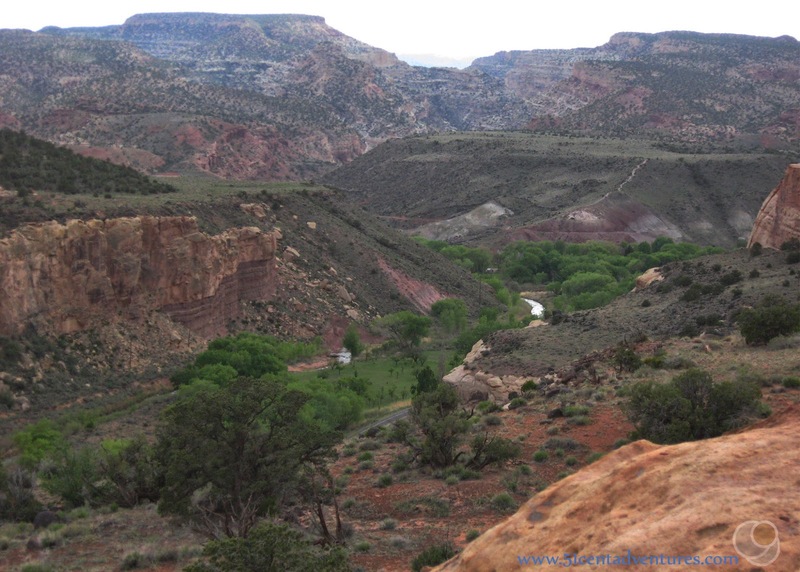 Fruita was a small town established by the Mormon Pioneers who settled this area. No one lives there today, but some of the buildings still exist. The fruit trees are also there. Visitors to the park can pick the fruit when it is in season. Our visit was in May so we were there too early for any fruit. There is also a first come first serve campground located in this area. I considered planning to camp at this site, but I'm leery of camping anywhere without reservations. This is what the Fruita area looks like from above. You can see the Fremont River flowing through the valley. The road followed the path of the Fremont River as we drove through the rest of the park. 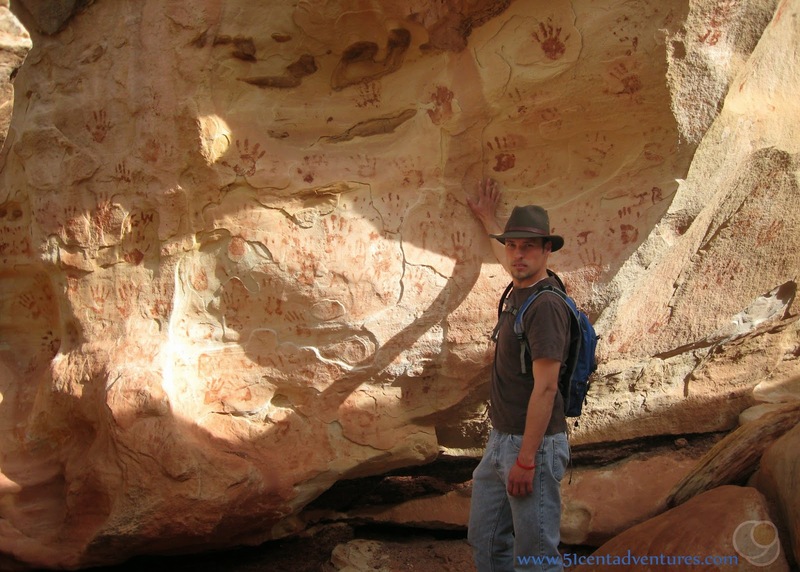 Our next stop was the area where we could see petroglyphs carved into the rock wall. 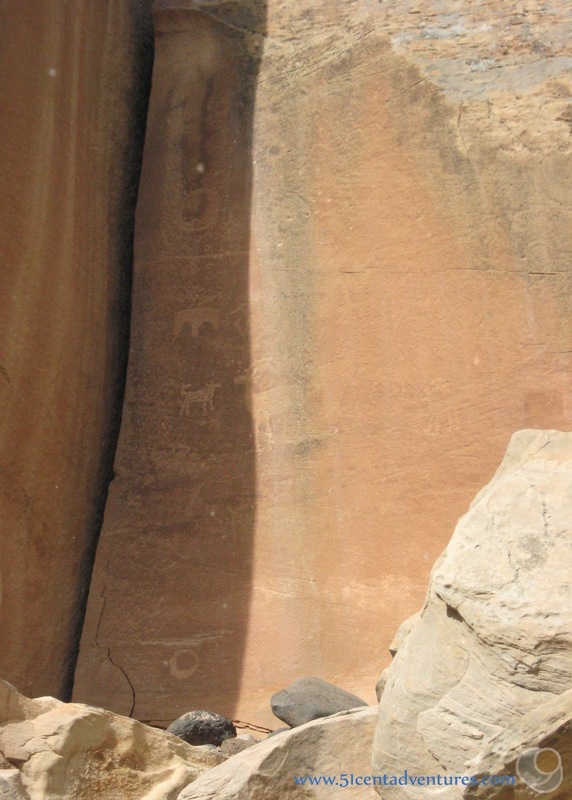 Most pictures of the petroglyphs show you what they look like from up close, but I want to show you what they look like from the walkway. Here you go. Kind of hard to see, right? The petroglyphs were interesting, but they were a lot harder to see than I expected. 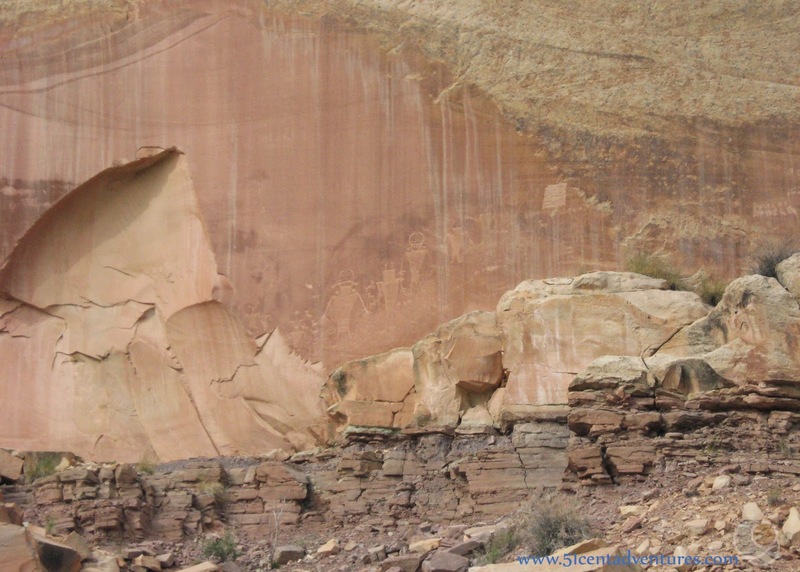 Even so, the petroglyphs are worth a look. 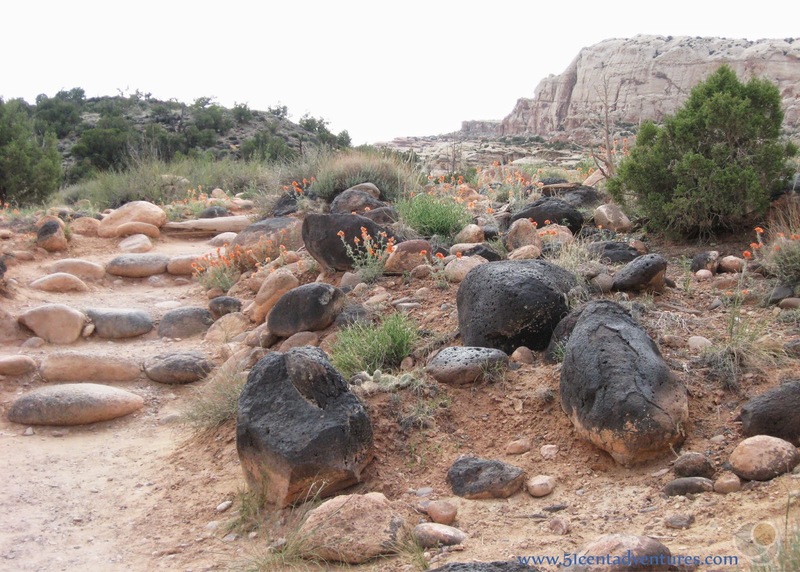 There was a nice boardwalk that stretched between the areas where the petroglyphs were located. I enjoyed walking under the green leaves of the trees. After all the red rocks I'd seen the last few days, the color green was refreshing. 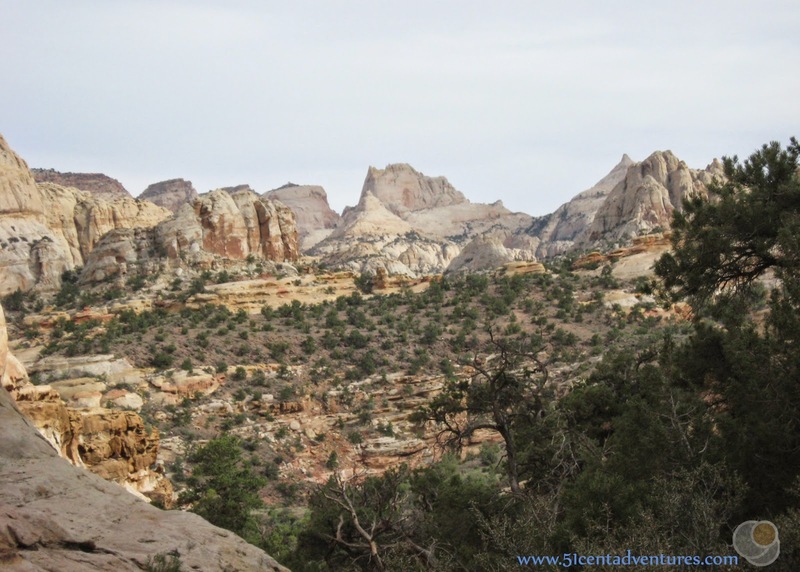 Up until this point, our visit to Capitol Reef had been pretty leisurely. We hadn't had to walk more than 100 feet from our car to see anything of interest. We were anxious to see what kind of hiking this park had to offer. The park's trail guide listed several hikes that were in the area. The trail to the Hickman Bridge was less than 2 miles long round trip. That seemed like short enough to keep us on schedule for the day, but long enough to be interesting. The trail was well maintained and easily marked. We picked up a trail guide at the trail head that explained the areas that we were passing through. We passed several interesting features along the way. Part of the trail followed a dry river channel. We could see where water would flow through a hole in a rock into a natural cistern-like cavern. When we made it to the Hickman Bridge we didn't see it at first. There is a rock wall behind it that prevents the bridge from standing out. We hiked closer and had a better view of the bridge. Near the bridge there was an overlook with a great view of the area. As we traveled through the park we could see many of the domed shaped rocks. These rocks look like the dome of the United States Capitol building. That's where the "Capitol" part of Capitol Reef comes from. The reef part of the name comes from the fact that the early explores of this area thought that the steep and impassive cliffs in the area were a barrier to travel just like a marine reef. From what I remember this is a picture of the official Capitol Dome feature. The park map listed two more areas of interest, Behunin Cabin and Orientation Pullout, but we didn't stop at either of those. Or if we did stop I didn't take any pictures. 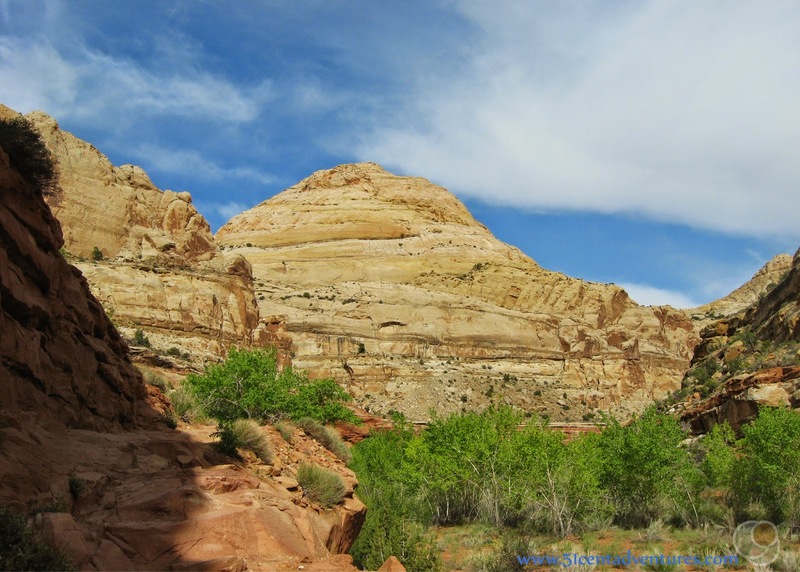 Some people would say that the small size and isolation of Capitol Reef National Park make it a rare gem - a place where you can appreciate the beauty of nature without dealing with a crowd. I won't argue with that. However, compared to the grandeur of Zion and Bryce Canyon, I couldn't help feeling like Capitol Reef National Park was unfinished. Recommendation: Even if you are just passing through the area, this park is worth a visit. There are many things that can be easily explored without venturing too far from Highway 24. 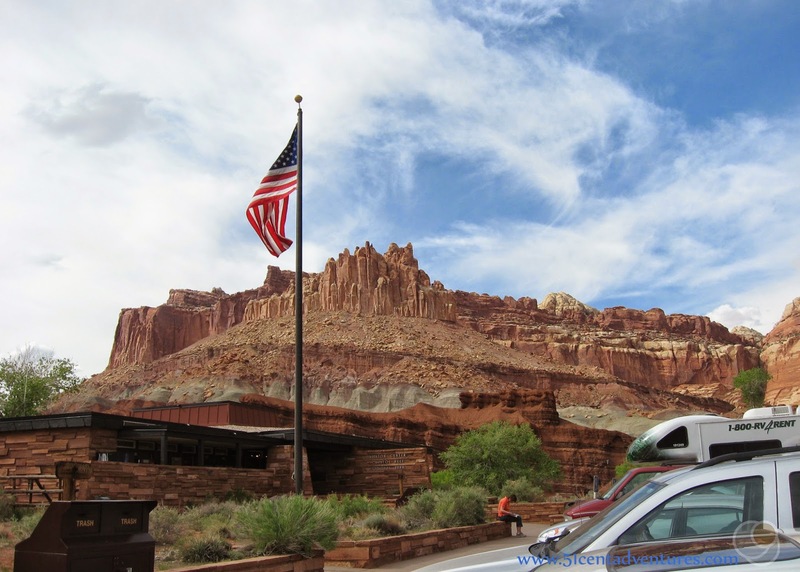 Directions: Most visitors to Capitol Reef will reach the park via I-70. If you are travelling from the East you will take I-70 to exit 149 and get onto Highway 24. You'll travel south and then west for a total of 94 miles on Highway 24. If you are travelling from the West you will take I-70 to Sigurd where you will get onto Highway 24. You will travel 84 miles east from Sigurd to reach the park. 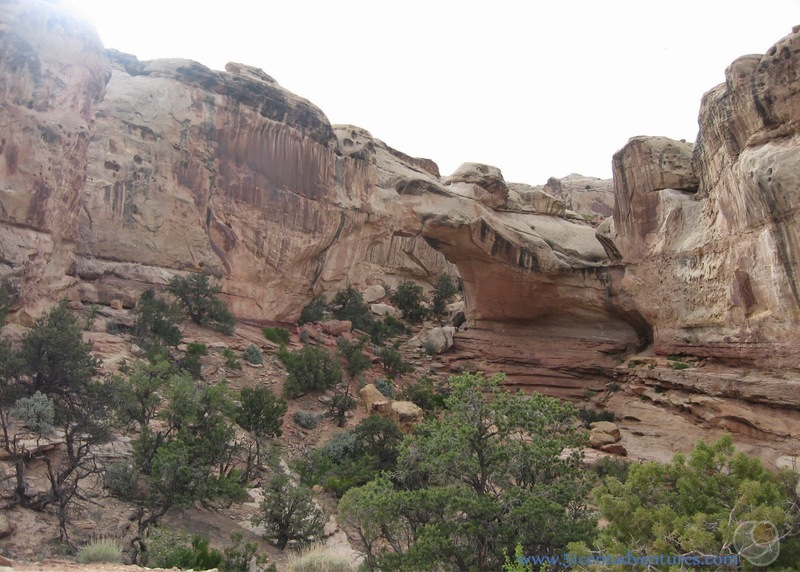 Additional Information: Most of Capitol Reef National Park is made up of the Waterpocket Fold which is basically a giant wrinkle in the Earth's crust. 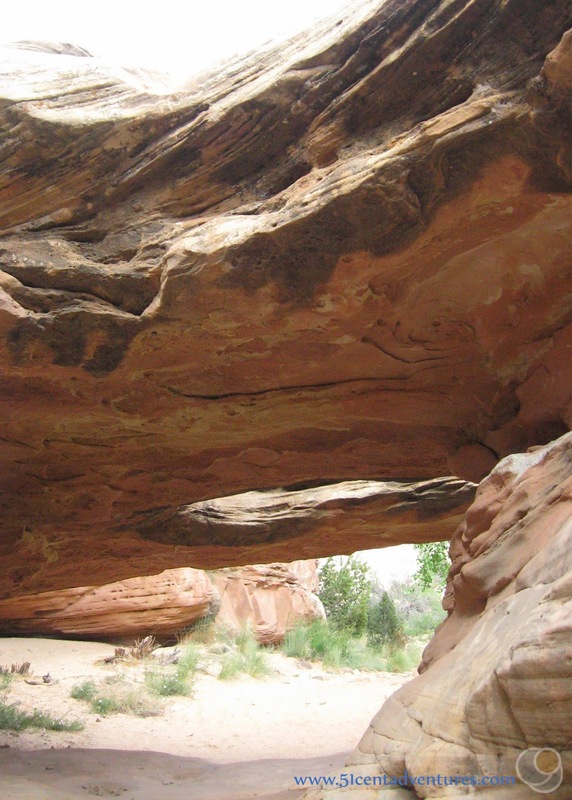 To learn more about the geology of the park visit this link http://www.nps.gov/care/naturescience/geology.htm. Places nearby: If we had had more time I would have liked to go hiking in the park's back country in the Cathedral Valley Area. I hear that area is like a whole other park. Visiting that area is definitely on my bucketlist. One day we'll see if the Cathedral Valley area is good enough to bump the park up into First Tier status in my book. Your blog information is really new for me. I never ever visited this park. After reading your blog I have decided to visit it after complete my west coast tour. You also captured awesome images. Your blog data is useful for those who go there first time.